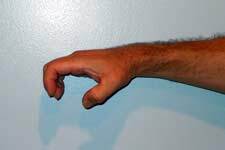 One of the most useful gripping techniques in the martial artist’s arsenal is called in Japanese washite (wa•shi•te, rhymes with “laundry day” and means, literally, “eagle hand”), which is substantially the same as the “eagle claw” found in Chinese kung fu. 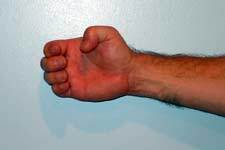 Washite is also sometimes called ry?te, or “dragon claw” by some styles. This grip is ubiquitous in Ying Jow Pai and similar kung fu forms and is also found as a primary application in numerous karate kata, including Rohai, Wansh?, and Passai. We usually call the basic version, with fingers kept closely together, the “C” grip simply because, viewed from the side, it looks something like the letter “C.” In addition, I’ve found that beginning students do better with it if we call it the “C” grip rather than the “eagle claw” because something about the latter term makes the student who is new to the technique execute it in a fierce, jerky manner, when it should always be smooth and relentless. Basic washite, “C” grip, palm view. You can see from the photos above that the fingers and thumb do not close into a full, choking grip. Instead they are held so that the grip is open. Rather than working like a tight clamp they work like an old-fashioned can opener of the type that punctures a triangular hole in the top of a can. To begin, you can imagine the tip of your thumb as the point of the can opener and your fingertips as the hook under the edge of the can. Like a can opener, washite relies not on squeezing, which would require that you be as strong as your opponent, but on leverage and efficient concentration of force, which requires little strength at all. And, like a can opener, washite can punch in quickly and deeply. Unlike a can opener, which works only one way, our hands and fingers are flexible and malleable. We can opt to hold our fingers close together or we can spread them apart. 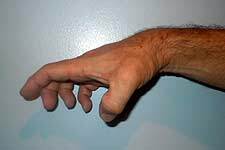 We can increase or decrease the distance between thumb tip and fingertips as we choose, to deal with changing situations. 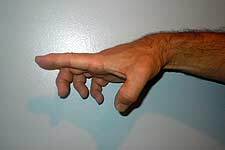 In addition, either the thumb tip or the fingertips can be the fulcrum. Or they can both simultaneously serve as fulcrums or leverage points, or they can alternate at it, as rapidly as is useful. Most important, we don’t need to use all of our fingers as leverage. Quite often, just one or two opposing the thumb will suffice. That leaves the rest of the fingers free to attack. Washite with free forefinger used as talon. 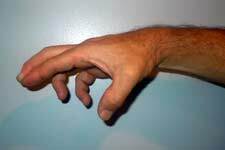 When we spread the fingers, the claw-like nature of the technique is easier to see. Washite with fingers spread and forefinger free for attack. Spread fingers and reinforced talon. 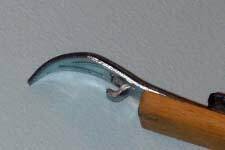 Washite is often disguised by keeping the fingers relaxed but straight instead of bent so that the “claws” are not evident. This makes for a useful element of surprise and deception when moving in on an opponent. If you are unaware of this technique within any of the kata you practice, perhaps because over the years it’s been disguised beyond recognition to even those who know the kata fairly well, you might try a bit of reverse engineering—analyzing the kata to see where washite might be hidden from cursory inspection. Reverse engineering of this sort, called bunkai ?y? in Japanese, is often fruitful in studying kata and ferreting out the “hidden” techniques. The eagle claw grip serves several functions, each with many variations. Two are more important than the rest. First, washite makes it easier to attack your opponent’s vital nerve points, to separate muscle from bone and connective tissue, and to apply leverage to your opponent’s limbs. Second, it makes it easier to release your opponent when it’s no longer useful to hold on. 1) Attacking your attacker. 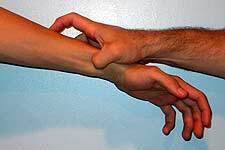 When someone is trying to grab or strike you they have to extend an arm or a leg. Instead of using your effort to knock that extending limb away, you can use washite to capture the limb, at least momentarily. You don’t have to aim for a particular spot to grab, as you won’t really be grabbing, as such, but intercepting. While you are in contact, you can press into nerves and connective tissue; press between nerves, muscles, ligaments and tendons; and use your attacker’s limbs for leverage for throws or tearing actions. You don’t have to have a steady hand, either, for it’s often more useful for the claws to be in motion, raking the nerves and muscles, sort of like stripping bark from a tree limb. Quite often, you can do all of these actions in one smooth motion. 2) Releasing your attacker. When we grab someone with vigor or urgency, we invest a lot of ourselves in the grab. We tend to hold on for dear life, even when it’s counterproductive to do so. If and when it becomes clear to us that it would be better to let go, there is always a delay that’s proportionate to the intensity of the grip—the release is often dangerously slow. If we train ourselves to use washite or one of the other grips with similar biomechanical principles, we can release much quicker and a lot more smoothly. In a way, the release is built into the grip.